What do I say about Vanish that hasn't already been said on every other blog? It's amazing, it's well-written, it's one of the best books I've read so far this year. Sometimes I have a phobia of reading the next book in a series, worried that it won't be as good as it's predecessor. This one? Better. Hands down. Jacinda is back and she's just as stubborn and passionate as ever. In fact, I really felt closer to Jacinda in this story because her emotions are so much stronger. She knows what she wants, and she's not afraid to break the rules if that's what it takes. As always, it doesn't exactly make her a popular character, but this time... well I won't spoil it but let's just say she takes some others along for the ride. I have always loved Jacinda's fire. That's why I was so happy that it is present and accounted for. One pleasant surprise for me though was that Cassian's personality is a lot more fleshed out in Vanish. I got to know so much more about him, and I really loved it. If I was having a hard time choosing a side before, now I'm even more lost. Readers will get a much better idea of the day to day life of the pride, which I thoroughly enjoyed. The plot is quick, but easy to follow, and the action sequences abound without taking the spotlight from the bigger picture. The relationships between Jacinda and the people in her pride are so much more vivid in this book. Characters that were previously hidden in the shadows emerge, develop, and become so essential to the story. 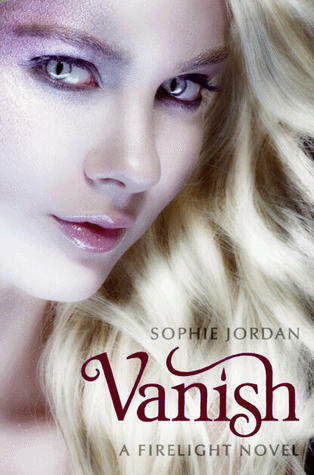 Vanish gave me a new appreciation for the world that Sophie Jordan had so meticulously built. I simply cannot wait for the next book! If you fell in love with Firelight, I'm going to personally guarantee that you'll eat Vanish up. Whether you are on the side of Will, or the side of Cassian, this installment has a great fiery love triangle that burns up the page. Pair that with a great story line and you have a book that I devoured. Start to finish in one night. Sophie Jordan fans rejoice! There is one more book left in this fabulous trilogy. Just be warned, the ending of this one will leave you wanting more.